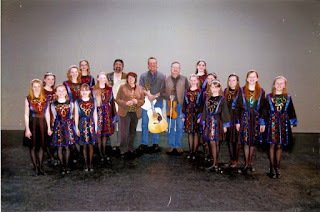 Idlewild is honored to be back at Peery's Egyptian Theatre with our old friends Celtic Beat and the Galway Pipers. The event is for Saturday March 17th, 2012 Saint Patrick's Day. The time is 7:30 pm to 9:15 pm. Experience the authentic textures of Ireland and Scotland at Peery’s Egyptian Theater’s annual Celtic Celebration. High energy jigs and lyrical ballads weave an enchantment. Step dancers bring fire and energy to the stage. Haunting pipes and drums inspire images of lonely cliffs and brilliant green fields. Come celebrate the Irish in you. Celtic Beat, Feet of Fire under the direction of LaRae Thackeray and the Galloway Highlanders Pipes and Drums will once again take the stage at the Egyptian. These phenomenal performers will be joined by the local Celtic group Idlewild. Dave Sharp on Irish Flute, Vocals, Storytelling, Cittern, Moutain Dulcimer, Carol Sharp on Whistle, Celtic Harp, Teresa Welch on Fiddle and Patrick Leary on Guitar. The historic Peery's Egyptian Theater is a community performing arts center in downtown Ogden. It hosts live musical and theatric events and also cinema. In past years the tickets have sold out some weeks before the event. In order to attend you may want to order soon. 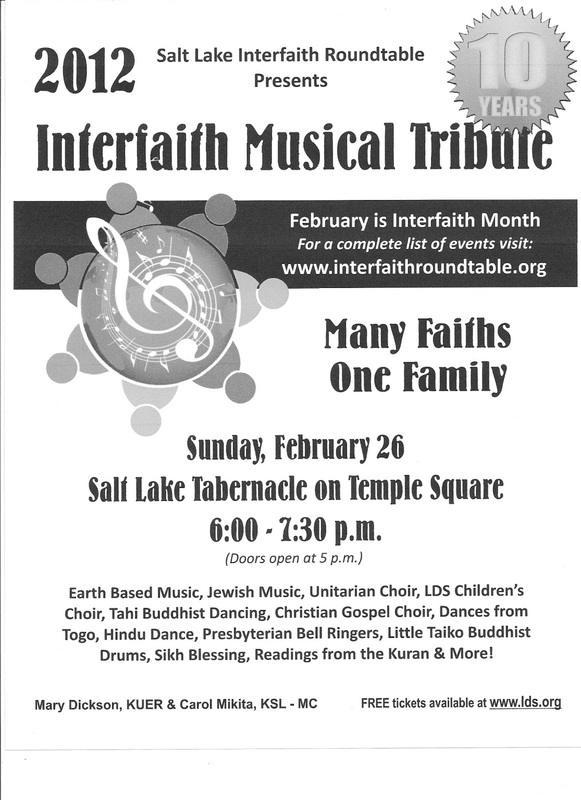 Sunday February 26th, 2012 at the Salt Lake Tabernacle on Temple Square. 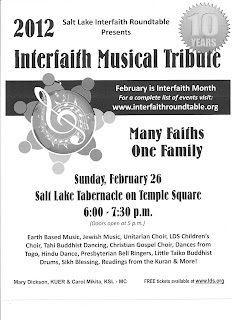 Earth Based Music, Jewish Music, Unitarian Choir, LDS Children's Choir, Tahi Buddist music and dance, Christian Gospel Choir, Hindu music and dance, Little Taiko Buddhist Drums, Presbyterian Bell Ringers, Native American Flute and more. Flutes from various cultures are featured elements of each of the groups. New York, New York Stake. Elaine has been with Interfaith from the start. She is one of the driving forces that keeps Salt Lake Interfaith happening. By religious faith she is a Quaker. The Ogden Buddhist Taiko Group is affiliated with the Buddhist Church of Ogden. The Buddhist Church of Ogden is a Jodo Shinshu Buddhist Temple which is a Japanese form of Buddhism founded in the 13th Century. The group is comprised of members of all ages and has been in existence since 1977. The group finds that performing is very satisfying both personally and spiritually. The sharing of the art of taiko with others is a great way of expressing both the Japanese art form of taiko but also of sharing the spiritual aspects of Jodo Shinshu Buddhism. In Buddhist taiko the goal for the player is to become one with the drum just as in Buddhism the goal of each individual practicing Buddhism is to become one with Buddha or to become enlightened. They will be performing “Ashura”, which translated means War or Warring Demons. Written by and played with the permission of Rev. Masami Kodani of the Kinnara Taiko Group. In this case the war described in this piece is not one fought on the battlefield but one that is demonstrated in our interactions with people and relationships in our everyday lives. In this piece the group plays as if in conflict with each other and then will end together as if in resolution of their conflict. The second piece was written by the Japanese taiko group Ondekoza in tribute to the people of Hachi Jo Island, one of the islands of Japan, an island unique in its support of the performing arts. The group Ondekoza taught this piece to Denver Taiko Group one of Ogden Buddhist Taiko Group mentor groups who in turn taught it to them. To honor the Earth as our Mother is a common spiritual theme passed down to us from ancient times. This includes honoring animals as well as the spirits of every grove, spring, rock formation or other feature of nature. We humans are not separate from nature, but are one aspect of it. We must do our best to stay in harmony with the whole of the natural world. Miners from Clackmannen from 1500 to 1848. The village was named after the megalithic standing stone next to the naval cross in the town square. Clackmannen is Gallic for “Stone of the Manu” or Sea God. set out for Utah in 1848.
written in the Scottish idiom. Named after the inlet where the village of Clackmannen is located. As an interesting side note: David’s family quarried and freighted the red sandstone foundations for the Tabernacle from their family quarry in Red Butte canyon in the east side of the valley. Kutrala Kuravanji is a grand musical play, set in the picturesque town nestled in at the foot of a mountain waterfall named Kutralam, in the south Indian state of Tamil Nadu. Written in beautiful ornate Tamil by Melagaram Tirikooda Rasappa Kavirayar in 1715 in praise of Hindu God Shiva and his son Murugan – the Tamil God for Valor, beauty and knowledge. A dance drama, set in verse and related by the young maidens of Kutralam, is one of both religious devotion and human love and paints a poignant picture of life in south India 300 years ago. The Kuravanjis are also known as Kurathis, who are the essential characters in the musical play. Kurathis are sooth sayers, and their tribe is very talented in craftsmaking. We are going to witness today one such song from Kutrala Kuravanji where the beautiful Kuravanjis dance about the pride of her beautiful rich mountain and land, -- the land that not only keeps them happy, but teaches them arts and also keeps them healthy in mind ,body and spirit, in short One with God ! The First Unitarian Church of Salt lake City acts as a bastion of liberal theology and thought along the Wasatch Front. Established in Salt Lake City in the late 19th century, its permanent home was established at 600 South and 1300 East with the building of its church there in 1927. Lead by Seven Governing Principles, Unitarianism has a strong directive to attend to social justice, mindful living and a conscientious awareness to the interconnectedness of all life and the well-being of our planet. Reflecting these ideals, members of the Chancel Choir will perform"Liberty and Justice". Composed by our Director of Music, David Owens, this piece is a rousing call to 'Sing with One United Voice with Liberty and Justice for All'. In the cold winter month of January of 1961 (Mama) Dr. Rosemary Redmon Cosby and her four young children left Indianapolis, Indiana by bus to Kansas and started out walking on the Highway to Utah in obedience to God after Mama received a call from God, To Go to Salt Lake City and seek His souls. Mama worked her way to Salt Lake preaching revivals and God answered their prayers on their journey giving Mama and her children safe rides and warming the weather up for them as they walked along the highway. After arriving in Utah, God richly blessed Mama after many hardships and years of faithfulness to God and hard work; truly a Rags to Riches story. Since Mama’s passing in January of 1997, Pastors Elder Mark & Co-founder Rosalind Cazares, Mama’s faithful daughter, keeps Mama’s beautiful legacy and continues her great work.We believe in the water baptism in the Name of our Lord and Savior Jesus Christ and receiving of the Gift of the Holy Ghost according to Acts 2:38 preached by Peter on the Day of Pentecost. We will next hear from a group of children from the Church of Jesus Christ of Latter-Day Saints singing a medley of Primary songs. The group is calling themselves the “Mormon Tabernacle Primary Children’s Choir”, and consists of children age 7-12 from the East Millcreek, East Millcreek North, Holladay North, Canyon Rim and Monument Park Stakes. They are under the direction of Susan Kaelin with Dean Kaelin at the piano. The Church of Jesus Christ of Latter-day Saints is the official name of the religion commonly called the Mormon Church. They believe first and foremost that Jesus Christ is the Savior of the world and the Son of God. While their backgrounds and experiences are diverse, Mormons are united by a belief that we are all children of God. They believe God has called a prophet that is on the earth at this time to guide and help all of his children. The church believes in helping all people and is involved in humanitarian efforts throughout the world. Name: Robaim Choun Por (Cambodian Classical Blessing Dance) This dance depicts goddesses descending from heaven to offer the world a blessing of peace and prosperity. This dance is often used as a way to bless the audience at the beginning of religious events or a royal ceremony. Names of performers to be listed in the program (directors, choreographers, etc): Performance by: Sinoeun Poeut, Sovanny May, Jenny Hor, Julie Hor, Samnang Loeung, Londa Loeung and Rannie Sin. Under the direction of Chanda Chuon. Cambodian classical dance is a sacred art form that is passed down verbally from generation to generation. In it's original form, only the king and his honored guests were allowed to view the performances. These dances were often used as a bridge to bind this word with the celestial world of his (the king) ancestors. Robaim Choun Por is used in the beginning of many royal and religious ceremonies to ask the gods to bless the audience with peace and prosperity. The "Reformation Ringers" are from three Protestant Reformed Tradition churches, Wasatch Presbyterian (Salt Lake City), Hilltop Methodist (Sandy) and Community Methodist (Ogden). The Methodist and Presbyterian churches grew from the Sixteenth Century reformation with leaders John Wesley and John Calvin. Our (Their?) beliefs are of One God—Father, Son, and Holy Spirit, saved by grace through faith, and encouraged to follow Jesus' lead of forgiveness and reconciliation. Presbyterians and Methodists differ from many other protestant churches in our (their?) emphasis of living out the mandate of Christ in actions of social justice. We will be playing "Fantasy on Kingsfold", believed to be written by Ralph Vaughan Williams, though also believed to be an English Folk Tune. Arranged for bells by H. Dean Wagner. The Reformation Ringers are directed today by Claudette Rothwell. Members of Jewish Faith. Jewish faith in Utah is diverse with several congregations. Jews have been in Utah since the mid-1800s. They will be performing and original composition called “OD TESHUVAH”.